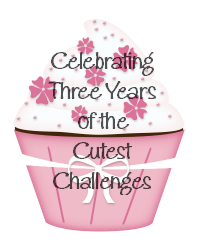 one happy little crafter: Celebrating Three years of Cuteness! Celebrating Three years of Cuteness! and we have some stunning creations from our soooo talented DT, so why not hope over and join in the fun! How many Three's do you think you could use on a card??? She is coloured with promarkers (with Three main colours), the papers are from Papermania Capsule Collection (I have used Three different papers) The Three worded sentiment is my own creation and the Three pearls, Three flowers and Three card candi blobs all from stash..........Loving this image, as I ran a week of Coffee Mornings in aid of Macmillan Cancer Charity at work last week, and after that and eating soooo many naughties, this is the only type of biccie I can cope with, lol! Very pretty card. Thanks for sharing with us at Penny's Paper-Crafting Challenge. 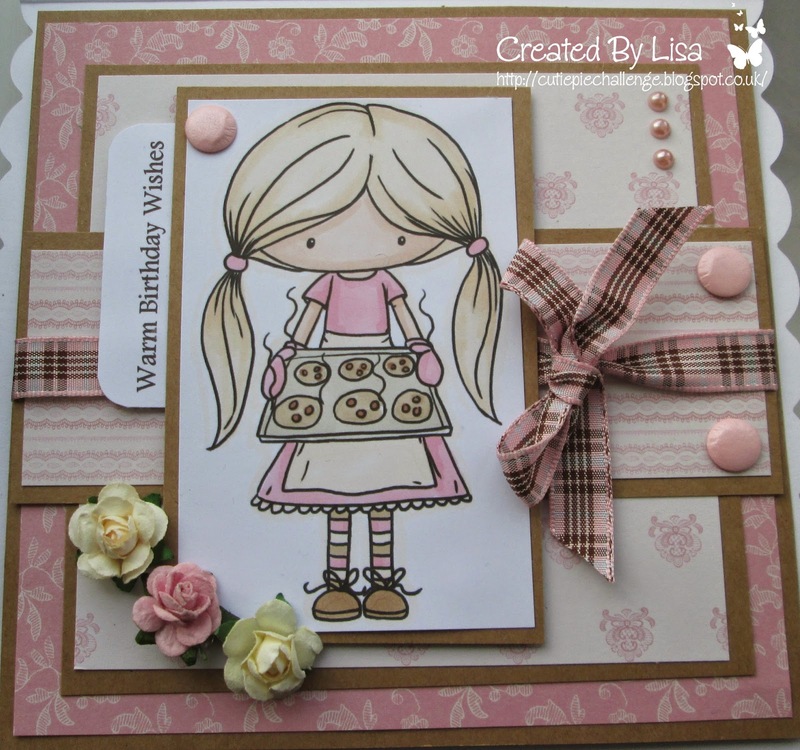 This is such a pretty card Lisa, I love your sweet image and pretty papers - fabulous design. This is gorgeous Lisa. I love the cute image, beautiful colours and pretty detailing. Happy Birthday to the Cutie Pies Challenge too, I think they are lucky to have such a fabulous DT leader! Adorable card, sweet image and love the papers. So gorgeous Lisa.Adorable sweet image and i love your pretty design and soft colours. Very sweet, very cute. Thanks for joining us over at PFP this week. This is lovely...Thank you for sharing with us at Penny's Paper-Crafty and good luck. A gorgeous girly card. Love the image and colours. Hi Lisa, I just popped back to say thank you for joining us at Di's Digi Designs. Hi Lisa, me again just to say thank you for joining us at Ooh La La Creations. Perfecty Purple and Completely Cutie!